Igualtats Connect | Come and participate! In the framework of the “Connected Equalities. 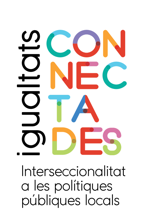 Intersectionality in public policies” project, a cycle of workshops on intersectionality in the city will take place. It is aimed at professionals working in the field of equality policies, people from entities, companies and other administrations that are interested in the subject, as well as the general public. The cycle consists of five sessions, which will take place between September and November 2018. Each session will deal with an aspect related to the subject and the complete cycle will provide a global and applicable vision of intersectionality. Therefore, registration is recommended for the entire cycle. If this is not possible, registration can be made for specific sessions. People who attend a minimum of four sessions will obtain a certificate. All sessions will be held in the Auditorium of the Vapor Universitari in Terrassa (Colom, 114). The space is physically accessible for people with reduced mobility and and it has a magnetic loop. In case any other accessibility service is required, it must be indicated on the registration form. The workshops are free but prior registration is required through the following online registration form.